Item #GSJ-6-NK-3900: 15 1/2" 14Kt. 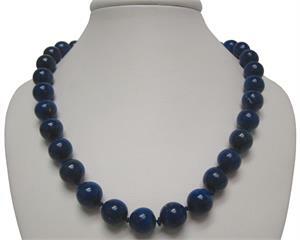 Yellow Gold necklace with Lapis Lazuli and forty-seven round Diamonds of .45 Cts. TW set in White Gold. Item #GSJ-24-NK-1700: 16" 14Kt. Yellow Gold necklace with carved Lapis Lazuli and thirty-three round Diamonds of .27 Cts. TW set in White Gold. Item #GSJ-24-ER-800: 14Kt. Yellow Gold earrings with carved Lapis Lazuli, twenty round Diamonds of .14 Cts. TW set in White Gold and post & clip backs. Item #17203: 14Kt. Yellow Gold lady's ring with carved Lapis Lazuli and ten round Diamonds of .07 Cts. TW set in White Gold; Size 6 3/4. Item #15822: Lady's 18Kt. Yellow Gold Ring with Interchangeable 12.5mm round Black Onyx & Lapis Lazuli Cabs; Size 6 1/2. Item #SC-CLLP-0047: Man's 14Kt. Yellow Gold Cuff Links with two bezel set 13x18mm Flat Top Lapis Lazuli Cabs and fourteen channel set round Diamonds of .17 cts. TW. Item #GSJ-6-ER-1150: 14Kt. Yellow Gold earrings with Lapis Lazuli and fifty round Diamonds of .50 Cts. TW set in White Gold; Post and Clip backs. Item #17204: 14Kt. Yellow Gold lady's ring with Lapis Lazuli and twenty-three round Diamonds of .23 Cts. TW set in White Gold; Size 7. Item #12504: 14Kt. Yellow Gold ring with Lapis Lazuli and eight round Diamonds of .11 Cts. TW set in White Gold. Size 6 3/4. Item #SC-SLLP-41-X1: .75"x.9" tall 14Kt. Yellow Gold Slide Pendant with three curved Lapis Lazuli Cabs and thirty-two round Diamonds of .17 cts. TW bead set in White Gold. Item #SC-ERLP-550: 14Kt. Yellow Gold earrings with 10x12mm oval Lapis Lazuli cabs, ten round Diamonds of .07 cts. TW set in White Gold and post & clip backs. Item #SC-EPLP-1238-X1: 7/8" long 14Kt. Yellow Gold Earrings with two prong set 8mm cushion Lapis Lazuli Cabs and seventy prong and bezel set round Diamonds of .49 cts. TW; Post backs. Item #SC-ERLP-0080: 18Kt. Yellow Gold Earrings with two 14mm cushion Lapis Lazuli Cabs and fourteen round Diamonds of .10 Cts. TW pavéd in White Gold. Post and clip backs. Item #SC-PTLP-0988-X1: 14Kt. White Gold Pendant with 12x16mm oval Lapis Lazuli Cab & round Diamond of .02 cts. Item #SC-PTLP-0043-X1: 14Kt. White Gold Pendant with 16mm round Lapis Lazuli Cab & round Diamond of .01 cts. Item #SC-PTLP-0991-X1: 14Kt. White Gold Pendant with 12x16mm oval Lapis Lazuli Cab & round Diamond of .02 ct. Item #SC-PTLP-0990-X1: 14Kt. White Gold Pendant with 14.5mm round Lapis Lazuli Cab & round Diamond of .02 cts. Item #SC-PTLP-0747-X1: 14Kt. Yellow Gold Pendant with prong set 8mm cushion Lapis Lazuli Cab and three bezel set and thirty-five prong set round Diamonds of .24 cts. TW. Item #SC-ERLP-0033-X5-W: 14Kt. White Gold Earrings with two bezel set 10x14mm oval Lapis Lazuli Cabs; Post & clip backs. Item #SC-ERLP-49: 14Kt. Yellow Gold Earrings with two bezel set 13x18mm oval Lapis Lazuli Cabs. Post and clip backs. Item #SC-ERLP-314: 14Kt. Yellow Gold earrings with 10x14mm oval Lapis Lazuli cabs, twisted rope trim and post & clip backs. Item #SC-ERLP-721-F1: 14Kt. Yellow Gold Earrings with two prong set 18x18mm fluted pear shape, Lapis Lazuli Cabs. Post and clip backs. Item #SC-ERLP-0033-X5-Y: 14Kt. Yellow Gold earrings with 10x14mm oval Lapis Lazuli cabs, rope trim and post backs. Item #SC-EFLP-0002-X6: 14Kt. Yellow Gold Earrings with two 12x16mm oval Lapis Lazuli Cabs; Post & clip backs. Item #SC-EFLP-0001-X6: 14Kt. Yellow Gold Earrings with two 12x16mm oval Lapis Lazuli Cabs; Post & clip backs. Item #17111: 14Kt. White Gold Lady's Ring with 12x16mm oval Lapis Lazuli Cab; Size 7. Item #17112: 14Kt. Yellow Gold ring with 13x18mm oval Lapis Lazuli cab and rope trim. Size 7. Item #SC-CLLP-14: Man's 14Kt. Yellow Gold Cuff Links with two bezel set 15mm Flat Top Lapis Lazuli Cabs. Item #LPCL-18: Man's 14Kt. Yellow Gold Cuff Links with two bezel set 10mm Flat Top Lapis Lazuli. Item #SC-CLLP-30: Man's 14Kt. Yellow Gold Cuff Links with two bezel set 12x15mm octagon Lapis Lazuli Cabs. Item #SC-CLLP-631-X1: Man's 14Kt. Yellow Gold Cuff Links with two bezel set 8mm square Flat Top Lapis Lazuli Cabs. Item #SC-ERLP-708-F1: 14Kt. Yellow Gold earrings with fluted Lapis Lazuli cabs and post & clip backs. Item #SC-ERLP-0008-F1: 14Kt. Yellow Gold Earrings with two bezel set 20mm round Lapis Lazuli high domed Cabs. Post and clip backs. Item #SC-ERLP-261: Lady's 14Kt. Yellow Gold Earrings with two bezel set 6x8mm oval Lapis Lazuli Cabs and sixteen round Diamonds of .09 cts. TW pavé set in White Gold; Post and Clip backs. Item #12198: 14Kt. White Gold Lady's Ring with bezel set 9mm square Lapis Lazuli flat top. Size 4.